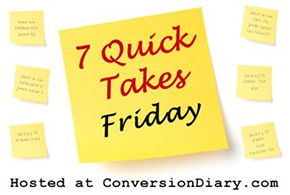 Join Jennifer over at Conversion Diary for 7 Quick Takes Friday. Less than three weeks until the Catholic Marketing Network Trade Show and Catholic Writers Guild Live. I’ll be surfing for swag and celebrity sightings at the former and talking on a panel and introducing speakers at the latter. I’ll get to hang with AnnMarie Creedon again! And Ellen Gable! And Margaret Realy! And (hopefully? pretty please?) Laura at Green4God! And FranciscanMom! Anybody else? I can’t believe it’s Friday, because it’s the week of VBS at our parish. Our parish runs VBS Sunday-Thursday, so because my brain is a creature of habit, it is always telling me during VBS week that Sunday is Monday, and Thursday is Friday… and now I’m confused. You may be, too. We live in Amish country. This means we are in the middle of a heat wave with high humidity… and our neighbors consider this prime time to lay down the manure on their fields. In principle, I’m all about organic farming. In reality… well, I’ll just wipe my eyes, pinch my nostrils and move on. 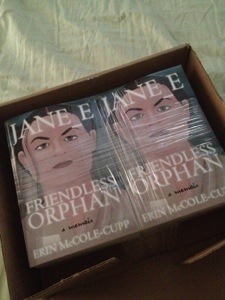 Speaking of CMN/CWG, I’ll be bringing a stash of these beauties along with me! If you’re going and want to pick up a hard copy, come find me at just about all of the CWG talks, and I’ll hook you up. Speaking of dystopic novels written by Catholics, I just yesterday finished Death Panels by Michelle Buckman. It was gripping, page-turning, and surprisingly satisfying at the end. I’m going to be bold and call it our Handmaid’s Tale. Well done, Michelle. And now for something completely different! Our family recently discovered how to make “instant” lemonade! Fill a tall Tupperware tumbler with ice, pour in about 2-3 tsp of lemon juice (juice of one lemon, if you have it), sugar to taste, then almost fill it with water. Secure the tumbler’s lid, and shake the bejeezus out of it. It keeps the kids busy, teaches them about how agitation helps dissolve solvents into solutes (did I get that right), and it is downright delicious! 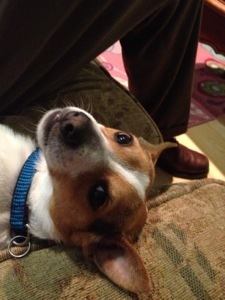 For no good reason, here is a picutre of my awesome Rat Terrier.